CM/F9 Courtesy of the Royal BC Museum, BC Archives. 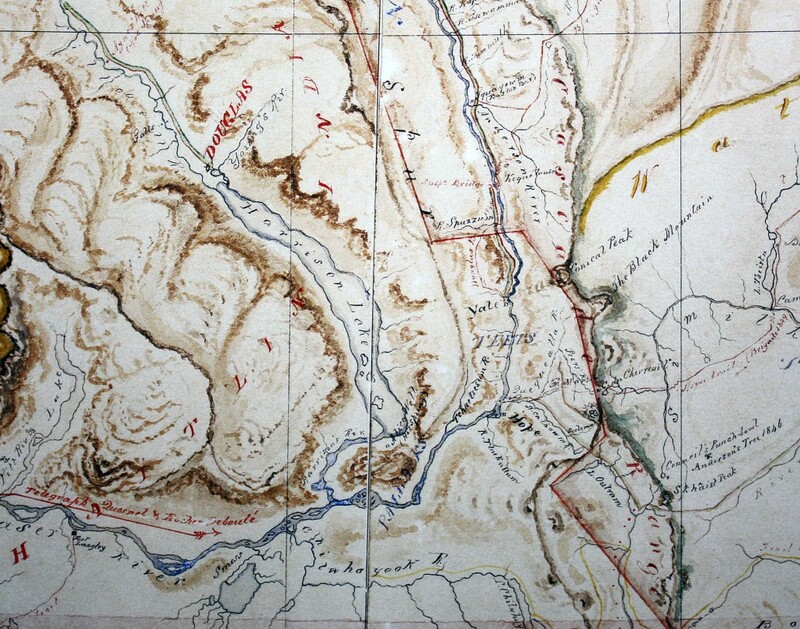 Detail from original map. Thursday 28th May  — Fine weather. Set out from Fort Langley at 11 1/4 am, having a large canoe well manned. Part of the Langley men, who proceed some distance up the river to establish a salmon fishery, are to accompany as far as the spot where I leave the river, whence they will return with the canoe. Encamped at 7pm a little below the Chilwhae-ook [Chilliwack], a stream issuing from the direction of Mount Baker. I have with me a chief of these parts, who has undertaken to guide me to the heads of the Similkameen, whence I shall contrive to reach the rendezvous where I had appointed the horses to receive me prior to leaving Kamloops. This, from all I could ascertain both at the latter place and Fort Langley, is the most probable, if not only, route by which it is likely we may discover a communication for horses, if such exist. I am much indebted to Mr. Yale for the ready assistance he had afford[ed] me in all respects, to promote the object of my journey. To the HBC men, the “Similkameen” was modern-day Tulameen River. Anderson did make his way to the Tulameen River, where he met Blackeye, the Similkameen chief. Black-eye (who it appears was trusted implicitly in these points by the late Mr. [Sam] Black) informs me that the horse road to the height of land strikes straight across the bend of the river, and falls beyond our encampment of the 3rd instant. He states that it is a wide and good road, with plenty of pasturage at the proper season; and that but for the depth of the snow, we could not have missed seeing it after crossing the height of land It is of course very short as compared with the long and painful circuit made by us…He expresses his willingness to guide us through it at the proper season; but like the rest of the country in that vicinity, it is impossible at present owing to the snow. The “shorter and better road” to Kamloops became part of the new brigade trail, but not until 1849. In 1847 Anderson made a second expedition, this time down the Fraser, returning to Kamloops by the Coldwater River valley. In 1848 that trail was used for the first time, and proved a disaster. Henry Newsham Peers was sent from Kamloops to Black-eye’s camp, to be shown over the height of land that Anderson had been unable to explore in 1846. In the end, this would be the new brigade trail between Kamloops and Fort Hope, and the Harrison-Lillooet trail, that Anderson had explored in 1846, remained untouched by any HBC man until 1858. The Fraser River gold rush changed all that!!! The California gold rush had emptied Oregon Territory in 1848: Chief Factor Peter Skene Ogden said “Gold has a charm about it that is irresistible.” It was true: in 1851, Ogden reported that “another Gold Mine had been discovered within 10 or 12 days march from this place, on the Klamath River (northern California). For this place upwards of three fourths of the Oregon population have already started, leaving their Farms totally neglected.” In the same year, another short but exciting gold rush lured miners north to the Queen Charlotte Islands. James Douglas, who already viewed gold as an expansion of the fur trade, sent a ship north to the islands after a Haida women traded a gold nugget at a northwest coast post. Late that year the HBC blasted for gold at a place they called “Gold Harbour.” They managed three blasts and collected 58 pounds of ore, but the Haida people threatened the miners with knives and clubs and collected most of the ore for themselves. In 1853 gold was discovered at the Grande Ronde, in the Blue Mountains. The gold rush proved a bust. In 1855, Angus McDonald, now in charge at Fort Colvile, stated that one of his men, while employed hauling firewood, had “amused himself by washing out a pannikin of gravel on a beach near Colvile.” Explorations found moderately productive diggings at the mouth of the Pend-d’Oreille River, forty miles north of Fort Colvile. A few miners made it to that point, but the Yakima Indian Wars prevented many others from reaching the Pend-d’Oreille goldfields. Those that made it that far moved north, and gold was found near the Kamloops post and on the Nicoamen River west of Kamloops! As Americans moved north from the Pend-d’Oreille, Douglas thought of ways of protecting the rights of the Crown. It seems that Douglas actually thought that the Americans would respect British law! In February 1858 his proclamation was published in the Olympia newspaper, and it would soon appear in the Oregon papers. By April, some 70 or 80 adventurers had “gone by way of Fraser River to the Couteau mines, without taking out Licences.” [James Douglas to Henry Labouchere, April 16 1858, p. 136, C/AA/10.1/3, BCA. “Couteau” was the Thompson River district]. In mid-April, ships stood empty because of the “universal desire among the laboring classes to see the gold district of Thompson’s River, many persons having already gone thither and several ships in Puget’s Sound having been deserted by their whole crews…” [James Douglas to William Smith, March 10 1858, B.226/b/15, fo. 41, HBCA]. Alexander Caulfield Anderson, now retired from the HBC and living on the Columbia River west of Fort Vancouver, was inundated with requests for information on how to reach the Thompson’s River goldfields. He wrote his Handbook and Map to the Gold Regions of Frazer’s and Thompson’s River and had it published in San Francisco sometime in or after May 1858. Finally, on May 8 1858, James Douglas informed Secretary of State Henry Labouchere that “on the 25th of last month [April] the American Steamer Commodore, arrived in this Port, direct from San Francisco, with 450 passengers on board, the chief part of whom are gold miners, for the “Couteau” country…Nearly 400 of those men were landed at this place, and have since left in boats and canoes for Fraser’s River.” [James Douglas to Henry Labouchere, May 8 1858, 140, C/AA/10.1/3, BCA]. 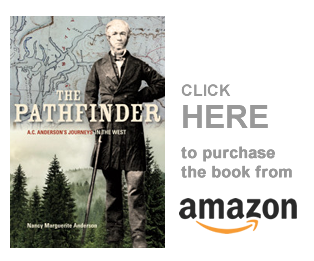 When Anderson heard of the miners’ difficulties in reaching the gold-fields of the Interior, he reminded Douglas of his explorations of 1846, when he had followed the chain of lakes and rivers from the Fraser River north of the canyons all the way to Fort Langley. The Hudson’s Bay men would never have been able to bring their loaded horses across any trail they could have constructed between or around those lake, but the miners had no need of horses. Once developed as a pack trail, this rough road might prove to be an efficient route around the canyons of the lower Fraser to the goldfields. [The Pathfinder: A.C. Anderson’s Journeys in the West, p. 175].